Step 1) When visiting our pterodactyl server list, click on the server that you wish to change the name on. 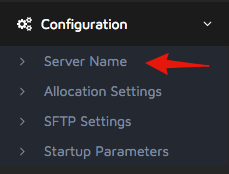 Step 2) Then click on “Configuration” in the left-hand sidebar, which will bring down a drop-down of selections and from that click on “Server Name”. Step 3) Then you may change the name of your server in the provided text box, be sure to click “Submit” when you are done!